UNOH Business Administration Professor, Dr. Robyn King, not only teaches full time in the College of Business, but also satisfies her passion for cooking with a new business venture "Over the Rainbow", a food truck serving up sandwiches, sides, and desserts. Read all about her trip along the yellow brick road to get her business up and running. I’ve been cooking since I was 8 years old; I grew up in a single-parent household and thought it would be a great way to help out my Mom and scratch my creative itch. Throughout the years, I never strayed too far from traditional foods and recipes until I got married in 2009. Having someone else to feed besides myself gave me a ready-made taste tester in the form of my wife, Julie. From that point on, I have grown into a full-fledged “foodie” who learns something new each and every week. But, cooking at home and for friends simply wasn’t enough. I wanted to experiment and create and feed lots of “hungry people.” While I never wanted to own a brick-and-mortar restaurant, my interest was piqued by the emergence of the mobile food truck as a means to do just that. While in the Air Force, I’d been accustomed to the “roach coach” that trolled the flight-line and remote work spaces, offering institutionalized sandwiches, snacks, and drinks. But this whole food truck revolution was so much more than that……..and it grabbed me. On our most memorable road trip ever, we drove her back to Ohio in December 2013. After several dead batteries, one tow job, 2 flat tires we were unaware of, a nonfunctioning heater or windshield wipers, we made it home still married and immediately turned it over to our very own College of Applied Technologies (COAT) students as a class project to do the maintenance inspection and fixes. Later, we contracted with a recent COAT grad to do the body work, paint job, and various other projects. She was starting to come to life! Three other COAT grads did an amazing amount of work on her last August get her near completion for a scheduled mid-2018 launch……….and to get our neighbors to stop complaining about having her in the driveway! That long road trip back from California had given me time to develop a name and a brand. As a member of the LBGTQ community, I’ve always been tied to the rainbow image. But, it also became more personal when several friends and family across the country saw rainbows the day my beloved mother June passed away in 2006. Naming the business “Over the Rainbow” was a sure-fire way to capture it all. 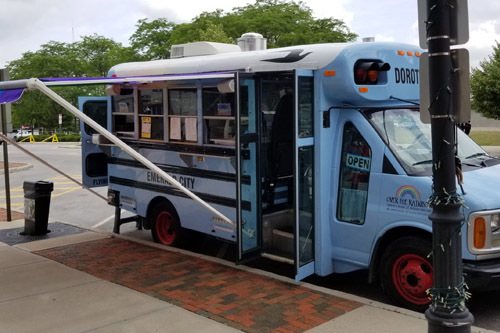 Naturally, the bus had to be named “Dorothy” and she was built out to serve “Wickedly Good Food.” With blood, sweat, and even a few tears, Julie designed the interior to within 1/16” of capacity and finished her out with some of the best technology available. She houses an on-board generator, full-scale oven, broiler, 2 freezers, sandwich station, and microwave. To meet existing and future health department requirements, we installed a full hood and fire suppression system, large fresh-water tank, on-demand hot water unit, 3-compartment sink, and handwashing sink. Creature comforts include a heating/AC unit, jump seat for my assistant, outdoor speakers, rainbow awning, and blue calico curtains, of course. Now, four and a half long years and many, many expenses later, my business is up and running. The menu is and will continue to be flexible as I try to match it to the venue. We’ve started off at the Lima Farmer’s Market on Tuesdays from 3:00-6:30 p.m., offering baked ham and cheese sandwiches, chicken salad on warm naan bread, coleslaw, veggie salsa, brownies and cookies. In the near future, we’ll be adding hot dogs in various forms, macaroni and cheese, baked beans, grilled cheese, ice cream treats, soups, and salads. From day one, I never intended for “Over the Rainbow” to make me financially rich; it’s more about pursuing and achieving a dream, much like Dorothy did in the Emerald City. And, it’s about paying my blessings forward in the form of philanthropic goodwill. Beginning with our first event on May 29th, we committed to designating a charity of choice each month to receive 10% of all revenue; this month we will be supporting Samaritan House, a Lima women’s shelter. NONE of this would have become a reality without Julie’s project management and engineering skills (and financial and emotional support) as well as the assistance of many local craftsmen, including our own COAT students and graduates. To all of you, I say a sincere “thank you.” Come see us soon!